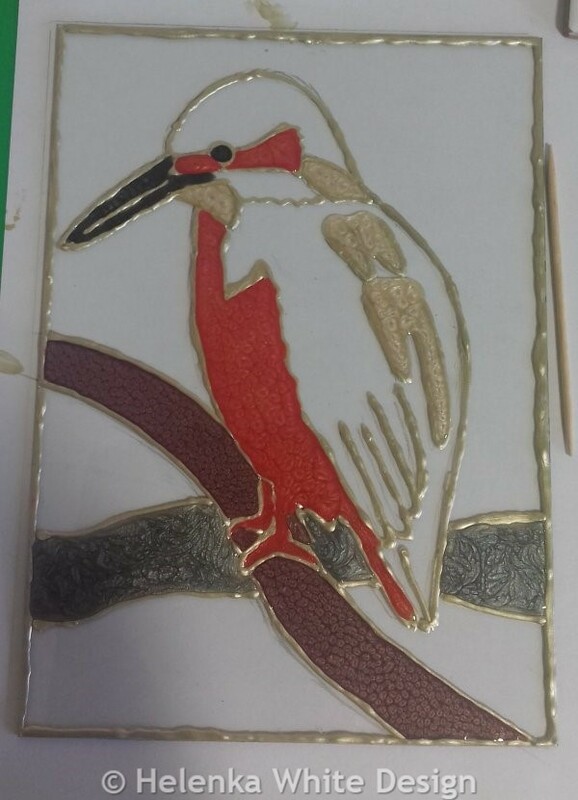 In this post I am sharing with you how I created this bird painting. 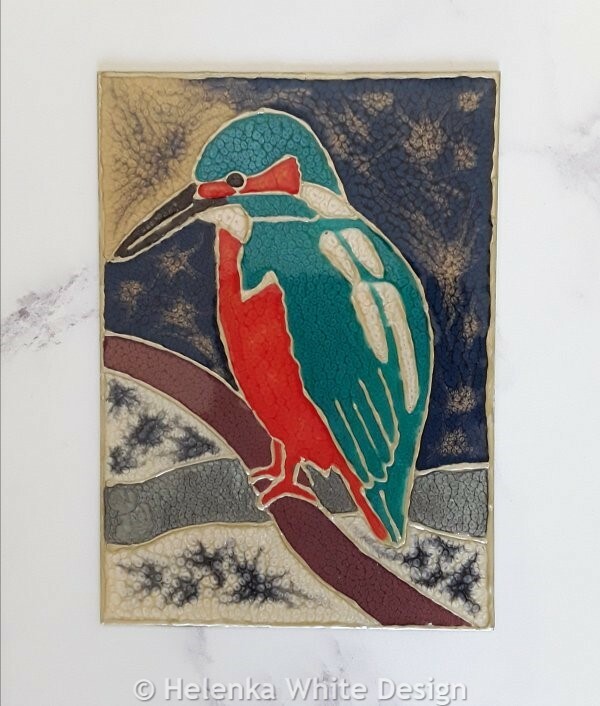 As you know I create mostly jewellery and sculptures, but I have rediscovered my love of painting and drawing and am currently taking part in Inktober – about which I plan a separate post. 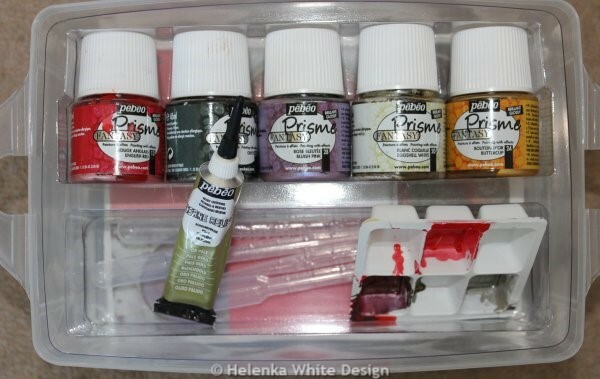 A few years ago, I bought a Pebeo Prisme paint set and it was just sitting in the corner of my work room. This year I finally decided to experiment with the colours. Pebeo box with colours, trays, pipettes and relief paste. First, I just tested the colours on some small aluminium circles to see how they come out and how you could combine them. The colours smell quite strong so keeping the window open was necessary. 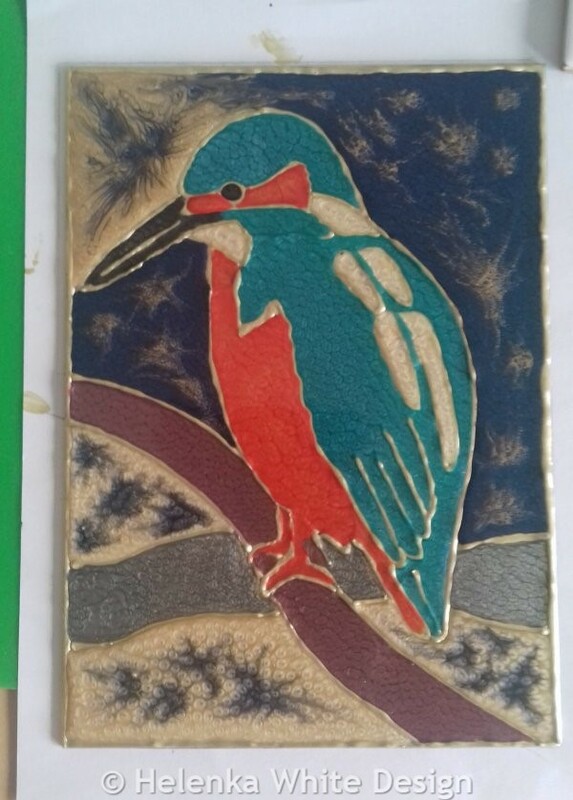 The next thing I did was using the colours on copper blanks and pendant trays. These eventually formed my new Painted Resin Collection, which you can find here. As these are pieces to be worn, I added resin to protect the colours. Luckily it was very hot this summer and the resin cured in no time. 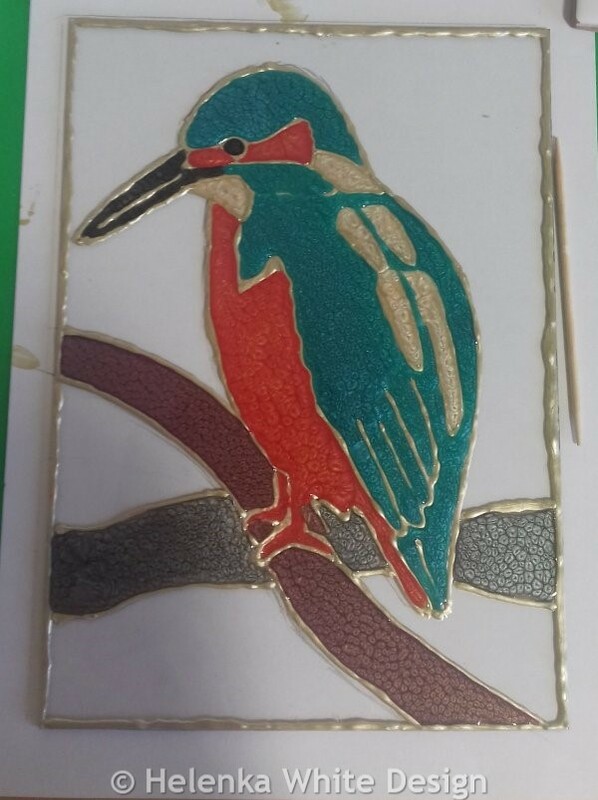 This was also the first time I actually used resin- it’s a bit messy and you have to be patient – especially with the bubbles. I used a straw to get rid of any bubbles. I am not sure that resin is my cup of tea. I might use it again in the future. 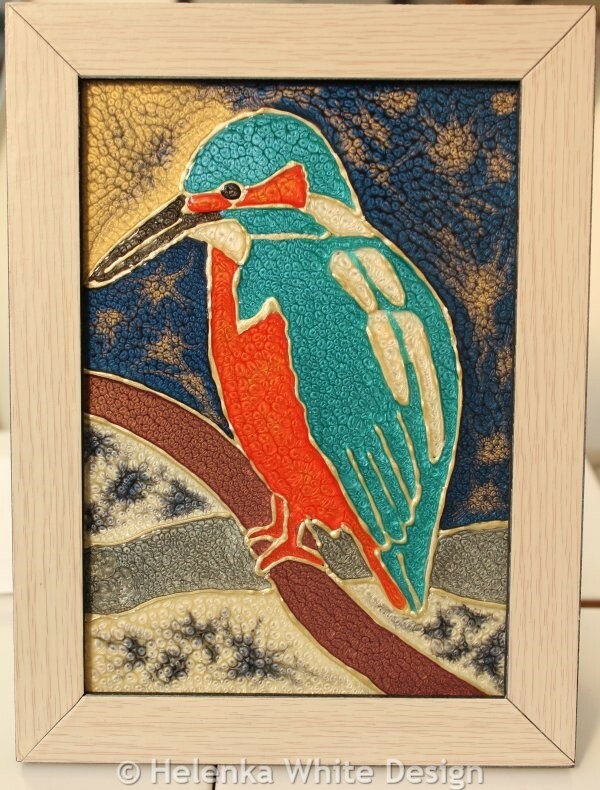 I found a small picture frame in my office which I bought years ago for a purpose I can’t even remember – I think for a tutorial I wanted to try in a polymer clay magazine. So, I thought that it might be interesting to use the colours to create an actual painting. Drawing the outline with relief paste. 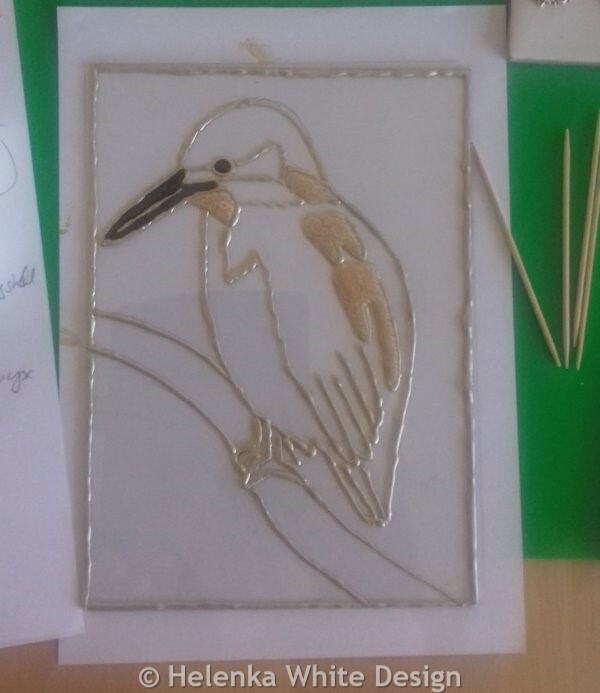 First, I drew my bird on to paper and traced it with the gold relief paste on the glass. This took a while as I made a few mistakes. It’s not so easy to get an even line as the stuff does come out in a blob first and then gets finer. Eventually I got the hang of it. I had to wait for half an hour until I started with my colours. The next step was just dropping each colour carefully into the designated area. Because I didn’t want to mess up and accidentally mix colours I waited each time for the colours to dry. For this I mostly used a tooth pick. You can see the sequence in the images below. Adding background at the bottom. Adding the colours in the top half. 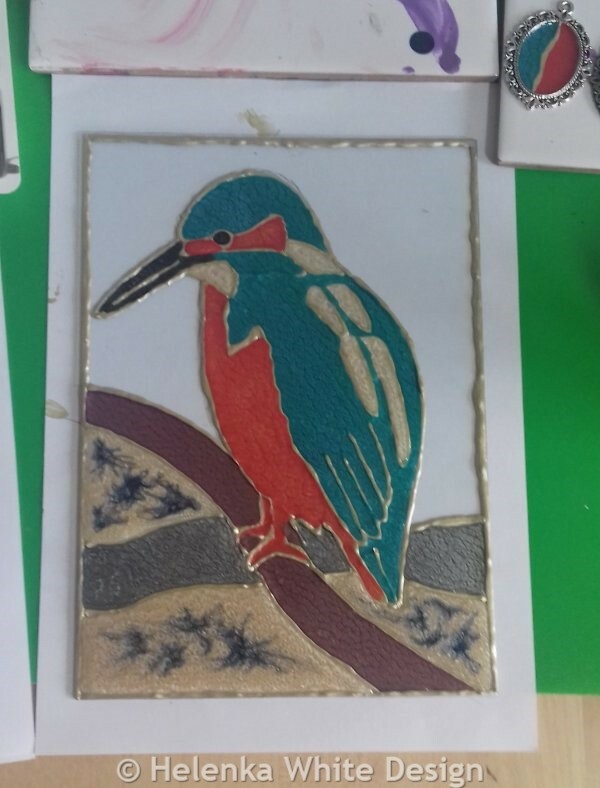 As you can see from the final images when I dropped in the background, the background colours have changed during the drying process. This is the beauty of the Prisme colours – they change over time and you get surprising (and unpredictable) results. I am quite happy how this painting turned out – so I have put it in its original frame. 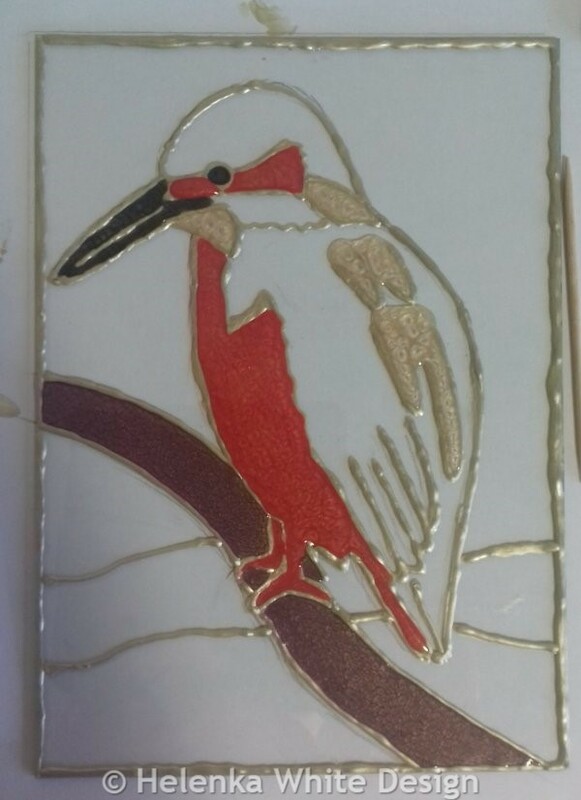 Bird painting in a frame. Now I am wondering if I should create these types of paintings for sale and include them in my shop?